She’s looking out my window! If we have any more than two weeks off from school and work, we are not ones to stay close to home – we will travel over 3,000 kilometres in two weeks just to see some new sights and add some more lines to our map! So this means quite a bit of car travel. July last year we set off on an Outback trip. The first day we left home and did around 560km to get to Nyngan and then another similar day to get to White Cliffs. 500km means a long day by the time you factor in travel time, morning tea and lunch and maybe an extra bathroom stop or two in between so we are generally looking at 7-8 hour days for the first couple of days. The kids are used to this by now but keeping them happy isn’t always easy! We do encourage the kids to turn the technology off once in a while and actually look at the scenery and where we are going and we often play games to pass the time. Our daughter gets car sick so we are limited to the activities we can do in the car… not much reading is allowed! So, if you are like us and do a bit of travelling in the car, try some of these to get you through the day! Here is my list of things to do on those long car trips! We have downloaded Spotify onto our daughter’s iPad and she has a play list that is “offline” that she can listen to in the car. She plugs a set of earphones in and happily listens to her music. DON’T FORGET THE EARPHONES or you will end up listening to the music as well!! AUDIO BOOKS are another great idea! You can borrow audio books online from your local Library and download them onto your iPad and the kids can listen to them with their earphones! Fantastic for kids that get car sick as they don’t have to read, they just listen to the story! If you see a yellow vehicle in motion you yell out “spotto” and the first to do so gets a point. Now the rules often change when the small ones in the back are in charge. They will often award a half point if they think you are worthy. For example a truck that has a yellow cab but white trailer could be a half point if they are feeling generous! I SPY – this is always an interesting game with a child under school age that can’t read or write… example: I spy with my little eye something that starts with T… family shouts out “tree”, “tyre”, “truck” and eventually family gives up with small child saying “it’s grass”!!! We do change this game up a little and play I SPY COLOURS… I spy with my little eye something that is blue! 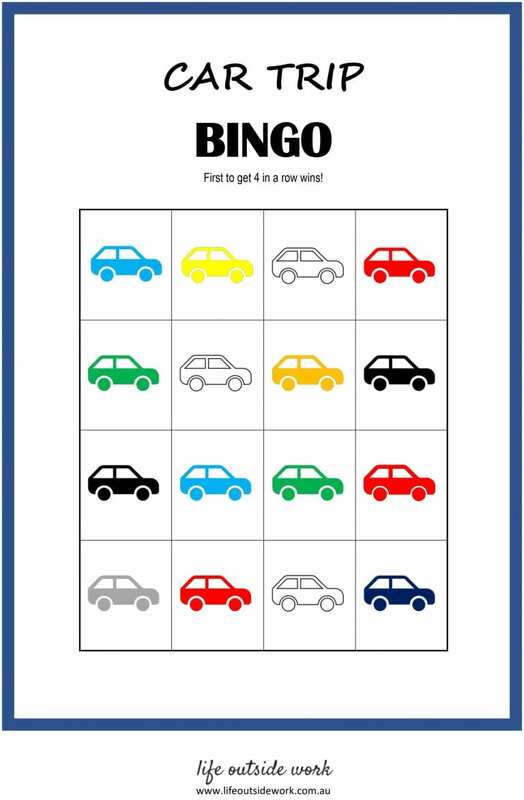 CAR TRIP BINGO is a race to get four in a row, either vertically, horizontally or diagonally! RULE: the cars have to be coming towards us! There are three different game sheets to download. Click here to download your FREE Car Trip Bingo Game. 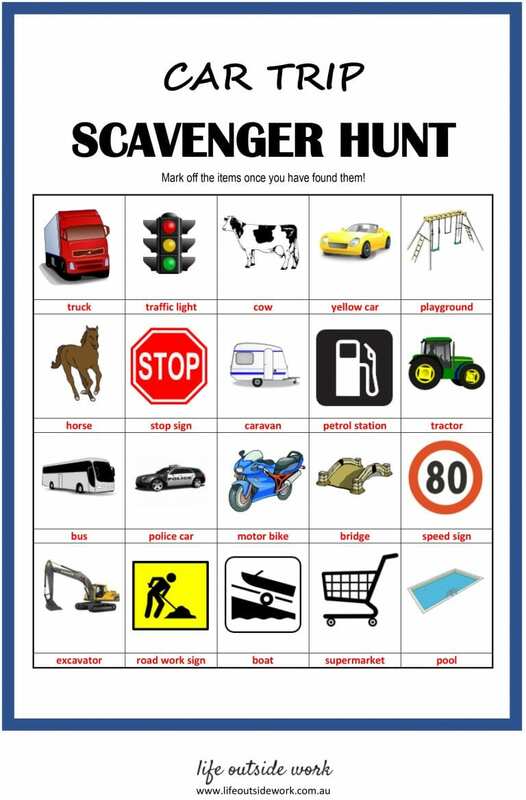 CAR TRIP SCAVENGER HUNT will bring out the competitiveness in your family as everyone tries to find the items first! There are two different sheets to choose from. 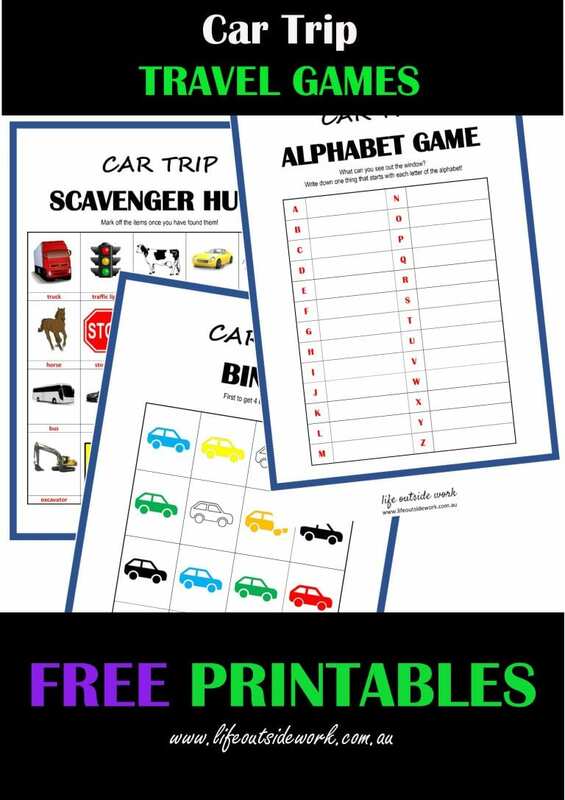 Click here to download your FREE Car Trip Scavenger Hunt Game. Find one thing outside that starts with each letter of the alphabet! 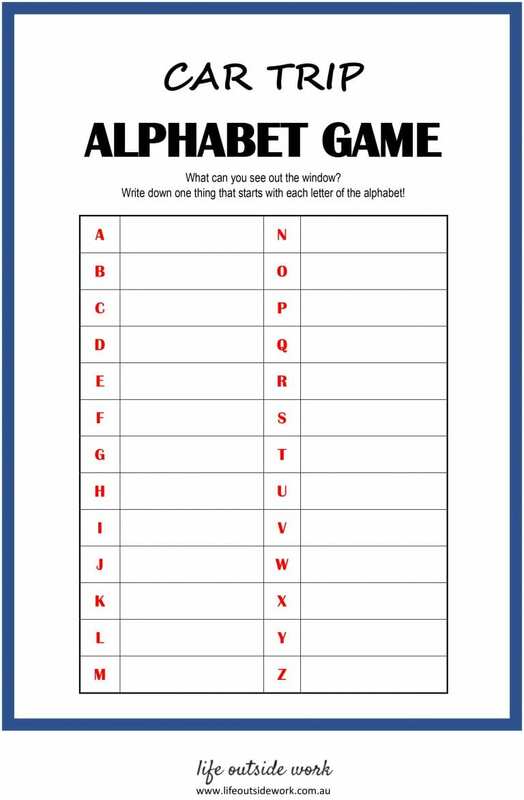 Click here to download your FREE Car Trip Alphabet Game. Laminate the game sheets so they can be used over and over again! A clipboard for each child gives them a hard surface to lean on while writing. Don’t forget the whiteboard markers! How brilliant and useful. Ill be saving these for when bubs is a bit older! Hahahaha! The I Spy story is hilarious! It’s always interesting taking the kids on a long car ride. We found that once our oldest could read and write proficiently, they had a lot of fun with games like mad libs in addition to the normal DVD player and coloring. Thanks for sharing at the #happynowlinkup! Yes it’s a different experience every time!! I agree it’s easier as they get older.. my youngest has started school this year so I Spy will get better from here on in haha! Thank you! I will be saving this page for when I have to drive 1000 miles with my kids in the car this summer! Very helpful! These are fantastic! We are going on a weeklong drive this summer, so I can’t wait to have these for my boys! Now this is a very valuable group of games and ideas! I kind of go through an almost PTSD like occurrence after a long road trip with my children 🙂 Thanks for sharing this! Great ideas. Pinned for our next Roadtrip. What a fun way to keep the kids entertained, I will have to bookmark this page so I can find it next time we are off on a big trip. Thanks Selina!